"While Bryson is the name of the station, the town is known popularly as Bryson City. It is the county seat of Swain County and is one of the most important places in western North Carolina. A peculiarity of the town is that it is bisected by the Tuckasegee River. The principal industries are lumbering and wood-working establishments. The country surrounding the town is devoted largely to general farming and stock raising. From far and near hunters and fishermen come here for the fine sport to be enjoyed in the vicinity. While the scenery in the neighborhood is not particularly beautiful, Bryson affords a most convenient entrance to some delightful trails through the Smoky Mountains. Cold Spring Knob rises just to the North of the town and to the South are Cliff Mountain, Rattlesnake Cliff and Rich Mountain, all interesting and historic peaks. About twelve miles from Bryson, over a first-rate driveway, is Terry Bald and thence, by a trail, it is about four miles to the crest of Clingman’s Dome, which rises 6,660 feet into the clouds, almost rivaling in altitude Mt. Mitchell, the highest peak in eastern North America." "Just outside of Bryson the Railway crosses a charming mountain stream called Deep Creek, a short distance beyond which is the little station of Governors Island, 62.5 miles from Asheville and 60.6 miles from Murphy. It is located at the junction of Goldbreak Creek and the Tuckasegee River. At this point the Railway swings sharply to the Southeast, again crossing the Tuckasegee River just before reaching the small way station of Ela, 62.1 miles from Asheville and 61 miles from Murphy. 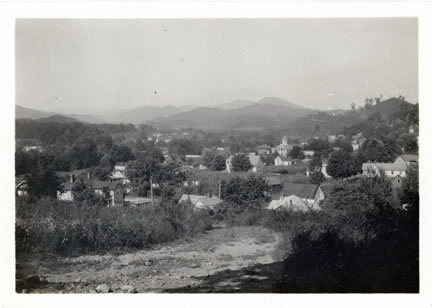 The next station is Whittier, N.C. "
A view of Bryson City, c. 1920, taken by Horace Kephart. The Swain County Courthouse, which dates from 1908, is visible to the right of center, and is distinguished by its dome. “. . . Beyond Waynesville there are streams all the way to Murphy; some far back in the forest, others quite near. 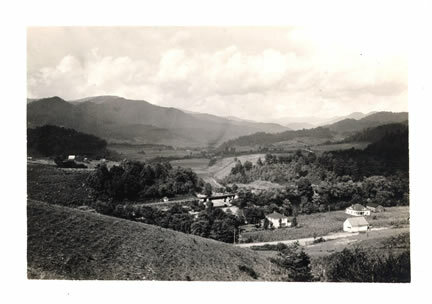 In this view near Bryson City, taken by Horace Kephart, c. 1920, the rail line and a road may be seen in the foreground and center. Even though the railroad provided greater passenger and freight transport than had been possible thirty years prior, residents of western North Carolina strived to improve connections to the region through improved roads. The 1916 tour guide Road Maps and Tour Book of Western North Carolina noted that, even though “Swain County offers many obstructions to road building, due to the many streams to cross and the steep topography of the country,” a twenty-two miles section of highway from Asheville to Murphy was under construction. “The prices paid for farm and garden products are good, being much higher than those received up to three or four years ago, but market conditions are very poor. There should be considerable improvement in this regard in the future as the reservation now has regular railroad communication with the outside world. Waynesville, quite noted as a summer resort, is only about 40 miles distant by rail, and Asheville, a city of from 20,000 to 25,000 inhabitants and even more noted as a resort is about 68 miles distant . . . .
North Carolina Corporation Commission. Fourteenth Annual Report of the Corporation Commission for the Year Ending December 31, 1912. Raleigh: Edwards & Broughton Printing Co., State Printers, 1913. Thomasson, Lillian Franklin. Swain County: Early History and Educational Development. Bryson City, N.C., 1965. U.S. Bureau of Indian Affairs. Superintendents Annual Narrative and Statistical Reports from Field Jurisdictions of the Bureau of Indian Affairs, 1907-1938. [Cherokee schools]. National Archives, M10111.